Seven stylish, scenic and history packed States that will charm you at every turn. New York is an amazing start, whilst the Hamptons brings a stylish end to this road trip tour. 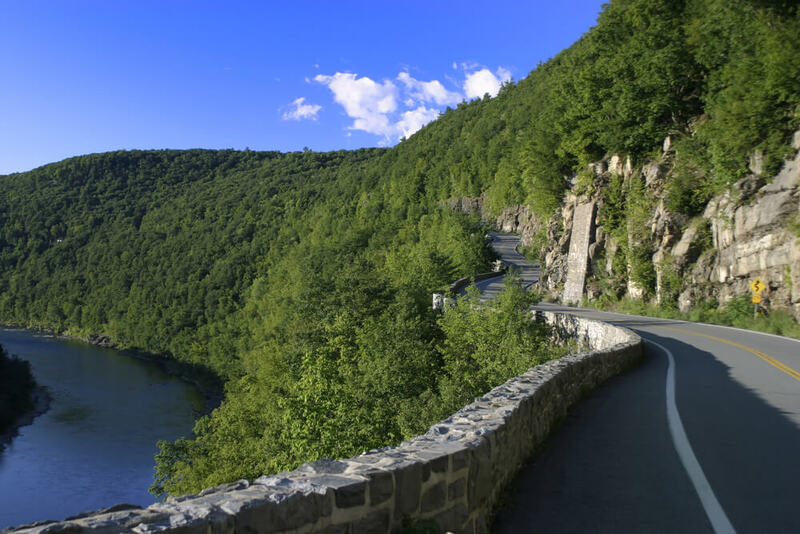 In between, you’ll cruise through New England’s best bits and along it’s most scenic roads. Welcome to New York! Starting in the upper west-side, this neighbourhood is a great base for your first day. This part of Manhattan has a residential feel combined with great shopping and foodie enclaves like the famous Zabar’s Deli. The American Museum of Natural History can be found nearby and is an absolute must see for all ages. Central Park is the most visited urban park in the US. With 843 acres of walking trails, ice rinks, cycle paths, a Zoo and even a castle you can easily spend the day here. Bordering one length of the park is 5th Avenue home to some of the worlds most renowned museums such as The Met and The Guggenheim. Madison and Park Avenue are here too, great for watching the wealthiest New Yorkers dip in and out the most luxurious designer stores. Downtown stretches to Battery Park at it’s most southern tip, where ferries leave to the legendary Statue of Liberty and Ellis Island. The financial district is anchored by Wall St, home to the New York Stock exchange and the National September 11 Memorial and Museum. Surrounding neighborhoods offer a great contrast to this commercial hub - Soho, Greenwich, Tribeca and the Meatpacking district are crammed with cool bars, shops and restaurants. Highlights include 5th Avenue shopping, Grand Central Station, the New York Public Library, Bryant Park, Times Square, Broadway and the Rockefeller Centre - just make sure you leave time to visit either the Top of The Rock or The Empire State Building as the Sun sets, to witness the city’s lights come alive on your final evening in the Big Apple. Bid farewell to the Big Apple and venture into the beautiful nature of New York State. The Finger Lakes await in the region which inspired the film 'It's a Wonderful Life', where you'll enjoy canoeing and museums at your pleasure. Head north for the Adirondacks Mountains and relax by Lake George where more than 6 million acres of protected nature awaits. This ski resort town is a cute as a button, provided state off the art lifts with small town charm. In the summer months, biking and hiking take over. And come Autumn, the leaves put on a show for all to see. Like Ice Cream? Then visit the Ben & Jerry’s factory that sits on the edge of town. Enjoy your second day in Stowe by exploring the rich history of the town, along with its excellent shopping opportunities. The mountain resorts provide excellent spas that allow you to relax in the calming nature. 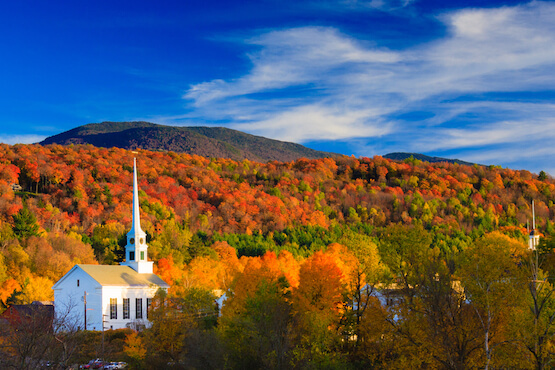 Drive from Vermont by travelling through the Green Mountains into the White Mountains. Jackson is famous for its distinct covered bridges, leading you to Mount Washington which is the tallest mountain in the Northeastern States. 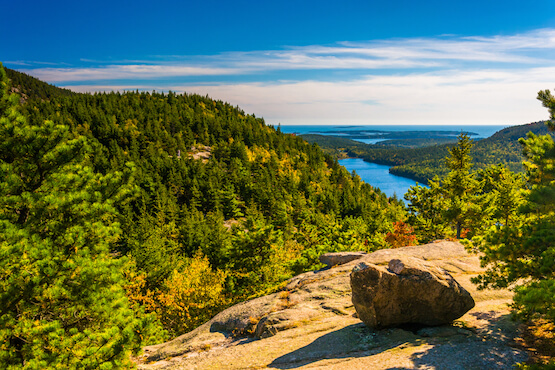 Today you’ll leave Vermont and drive through New Hampshire on your way to Acadia National Park in the state of Maine. People have been drawn to the rugged coast of Maine throughout history. Awed by its beauty and diversity, early 20th-century visionaries donated the land that became Acadia National Park. The park is home to many plants and animals, and the tallest mountain on the U.S. Atlantic coast. Today visitors come to Acadia to hike granite peaks, bike historic carriage roads, or relax and enjoy the scenery. A full day to explore every corner of Acadia National Park, in the autumn months the park becomes just as colourful as the roads throughout New England that have taken you here. Enjoy your breakfast in Acadia National Park before heading south to Kennenbunkport, where you'll enjoy one of their famous crab meals. Bask in the sun of the wonderful beaches that find themselves in this classic New England fishing town. When the pilgrims got lost when searching for New York, they happened across this patch of land and named it after the port they had departed on the over side of the pond. Today you walk in the footsteps of the Native Americans and the Pilgrims, or visit a stunning replica of the Mayflower boat that carried them. 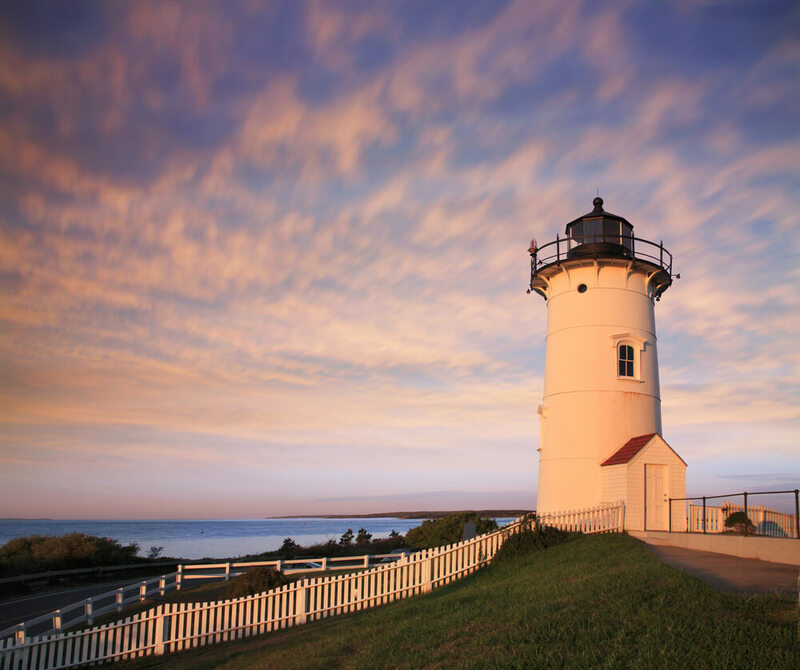 Afterwards, take the scenic Highway 6 out to Cape Cod’s Provincetown. Summer home for the Kennedy's, this 65 mile long peninsula offers historic towns, fantastic sea food and wild sand dunes. Packed in the summer months, however spring and autumn also offer enjoyable weather and migrating birds. From your Hotel or B&B, you’ll be able to relax among the natural surroundings. 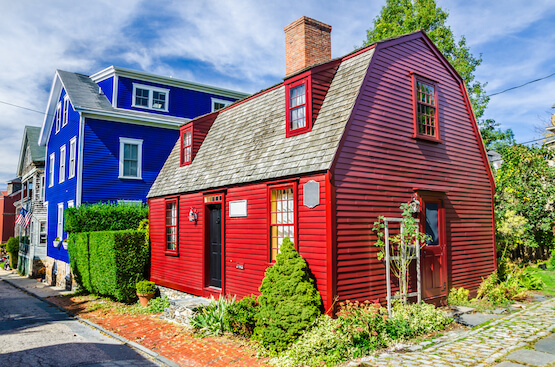 Enjoy the beautiful scenery on the coast of Rhode Island, filled with classic Colonial architecture that have been the centrepieces for several Hollywood films in the past decades. 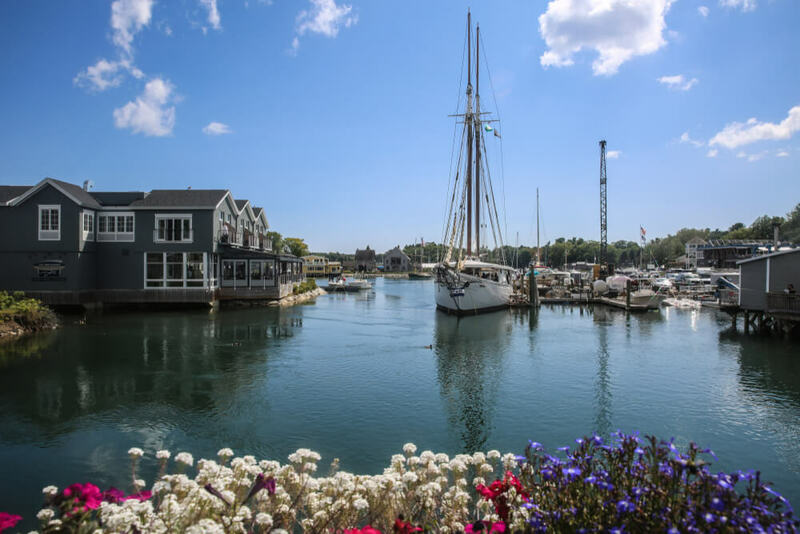 Newport is a perfect summer getaway for travellers that enjoy the salty smell of the ocean, wind caressing their hair with history surrounding them from all areas. 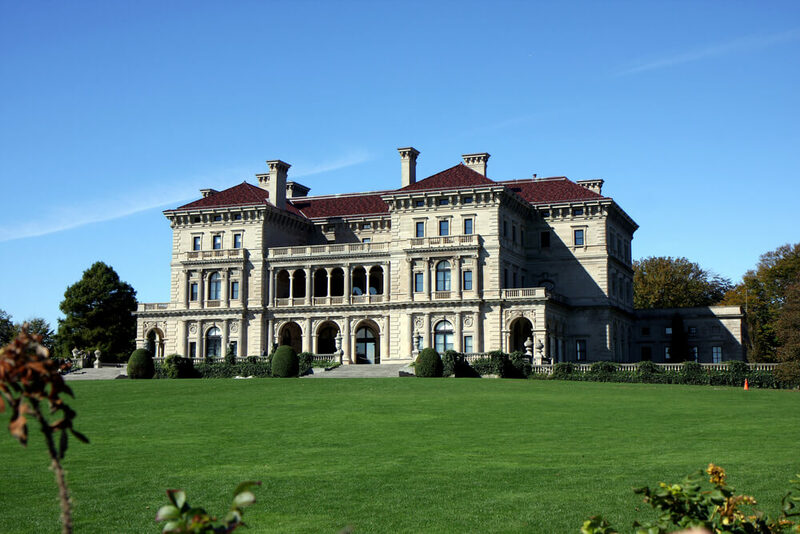 One day in Newport is rarely enough as there are countless landmarks and museums to visit. Once you've enjoyed a meal by the beautiful beach and taken in the scorching sun, ready for a trip south to the USA's most exclusive beach resort. 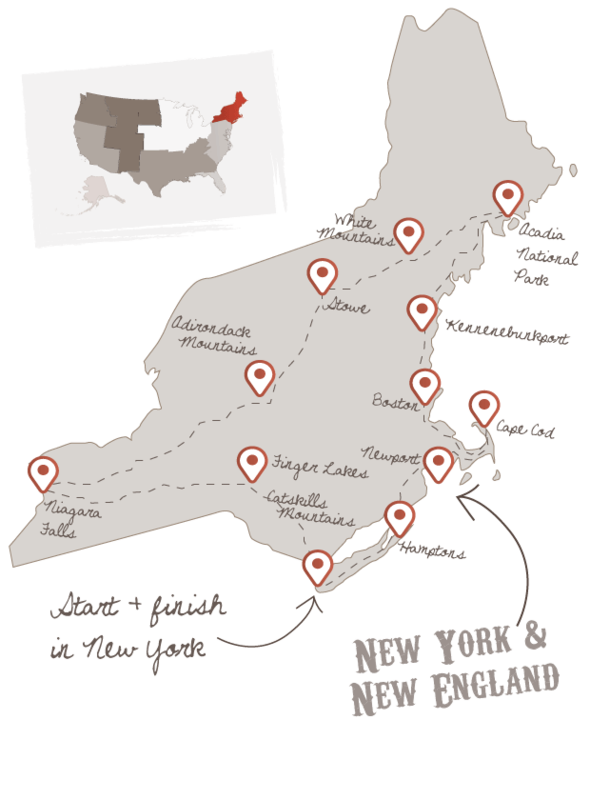 Pick your route to hit your favourite landmarks, before driving the 90 miles or so to the Hamptons. The Hamptons is home to many of the East Coasts rich and famous, and some of the mansions need to be seen to be believed - but this area also offers charming clapperboard cottages, windmills and adorable village settings. Cruise around the leafy streets and enjoy great seafood lunches by the beach. A beautiful finish to your Road Trip, with the plane home awaiting you the next day. 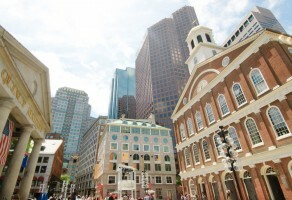 Don't forget to check out this road trip's Itinerary tab to see more amazing pictures from our "Ultimate New England " tour. You'll also be able to read a little bit about what you'll be getting up to on each and every day of this incredible holiday adventure.